(0%) 0 of 8 customer would recommend this product to a friend. The PureLine Prime Variable Speed Pump utilizes Century’s fully featured V-Green 270 motor, delivering premium energy efficiency and program flexibility with an integrated user interface. The PureLine Prime Variable Speed Pump is an exact replacement to the Hayward Super Pump Variable Speed Pump, making it quick and cost efficient to replace. Not sure what the head is. Pool is about 40K. I have a Raypak Heater and 60 Sq. ft filter. Skimmers are about 70 ft and 20 ft away. Drain about 40 ft. about 4 different 3 ways on the pool lines. Wondering will this work for me and what is the number that I can run a variable on for energy reduction. I run the current 1.5 hp and a 2.2 SF for about 10 hours to insure there are no issues. Seems to work. Anything less I can get some algae. A Answered on 4/21/2019 by InyoPools Product Specialist Patrick P.
Hi Michael, Thanks for that information as it is helpful. If you currently have a 1.5 HP pump with 2.2 SF then this pump would have almost the exact output as your current pump when it is running at the high speed. This would be a great variable speed pump option for the pool you described and would be our suggestion. We currently have a Pentiar SF-N1-2a single speed and want to upgrade to a VS pump but maybe use the our Hayward aqua plus PL Plus controller to control the variable speed settings on the pump. Would this pump be a drop in replacement for the Pentiar? Would we have to get any additional equipment to get the Hayward to control the speed of the pump? Hi Dave, This would not be a drop in replacement to Pentair pump as the plumbing ports are in a slightly different location so you would have a little bit of re-plumbing but it shouldn't be too bad. All of the programming for the PureLine Prime Variable Speed Pump would be done directly on the onboard pump controller, this is where you would set your schedules, RPMS, etc.. The Hayward Aqua Plus would simply power the pump on and off and then the controller on the pump would take over from there based on your programming settings. You would not be able to adjust the RPM's or program the pump from the Aqua Plus. Hi Bill, We want to buy to purchase the PL 2606, our pool will be about 24,000 gallons with 30 feet head. What sand trap do you recommend ? A Answered on 4/1/2019 by InyoPools Product Specialist Patrick P.
Hi Sherry, We would suggest the Hayward S310T2 Sand Filter to pair nicely with the PL2606 PureLine Prime Variable Speed Pump on a 24,000 gallon pool. what's the difference between the 2606 and the 2626...other than the 2626 says 'good for salt.' Any other difference? A Answered on 3/28/2019 by InyoPools Product Specialist Patrick P.
Hi Bill, The PL2626 uses an ultra heavy duty shaft seal made out of a material called Viton. The shaft seal is the most common part which fails on a pool pump and when the shaft seal fails it allows water to get to your motor and eventually ruins the motor. The Viton shaft seal in the PL2626 is great for more demanding pools like salt pools but it is also a good upgrade for standard non salt pools. A Answered on 3/19/2019 by InyoPools Product Specialist Joe S.
Good afternoon, yes base on the pump you have and the specs provided the PureLine Prime 2.7 HP Variable Speed Pool Pump would be a great option for a replacement. Can this pump work with 1-1/2" plumbing, or is it too large? I have a 1HP (1.25 SF) pump with a .75HP (1.5SF) booster pump for a pressure side vacuum. Primary pump is dead, booster runs fine but I am willing to go to a VS for cost savings. Hi, Brett S. It is preferable that 2" plumbing is used due to the total hp. Thank you for your quick response. I understand that 2" lines are preferred, but is it required? I have 1.5" lines only. I am wondering if they would be sufficient to handle this pump, and if not, would the 1.65HP model (PL2605) be strong enough to meet the demand that my current 2 pump setup provides? Commented on 3/6/2019 by InyoPools Product Specialist Lennox H.
This is my current set up. Need to replace the motor and impellers at the very least. Was looking into a variable speed pump to upgrade my system. What would you suggest as the best most cost effective option. Or would you suggest fixing what I have? If that is the case what all will I need. Hi, Joshua. Unfortunately, most replacement parts are obsolete for your Purex AH Series Pump so replacing it will be your only option. The pump you have is a high head pump, so you will need a pump like the TriStar VS Pump - SP3202VSP, or the IntelliFlo Variable Speed Pump - 011018. To find out if this pump will meet your pool needs, you will need to calculate the Total Dynamic Head (TDH) of your pool. 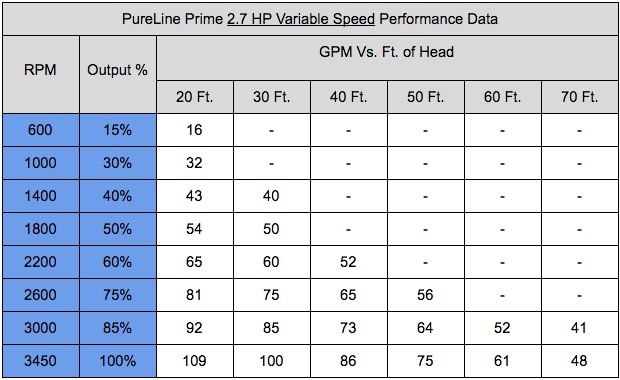 How quiet is the Pureline Prime var. spd pump? Does it compare to the Pentair 342001 pump? Why does the Pentair sell more pumps? Hi. The Prime VS Pumps are very quiet. It is in the same class when it comes to performance as the Pentair Superflo VS Pump except for the operating voltage. The Prime VS Pump 1.65 - PL2605 is suitable for the Pentair SuperFlo VS - 342001 if the customer has 230 volts. The Prime VS Pump 2.7 will outperform the Pentair SuperFlo VS - 342001. Pentair is one of the leading manufactures with a full line of swimming pool and spa products. Good day, the PureLine Prime 2.7 HP Variable Speed Pool Pump PL2606 would not be a drop in replacement for the Intelliflo 011012. You would need to re-plumb your system when installing this unit. Would this pump be a good replacement for my Jandy 2.7 Variable speed pump? See photo attached. The PureLine Prime VSP would be a great fit you are not using a Jandy AquaLink Automation System If you are tieing your Variable Speed Pump into a Jandy AquaLink Automation system then you may want to stay with the Jandy pump as you will get all of the read out of the Jandy pump on the AquaLink, however if you are not using a Jandy AquaLink automation system then the PL2606 would be fine. You may have a little re-plumbing but nothing major. This Pump uses a 2.7 HP Variable Speed Motor by Century the voltage is 208-230V and the amps range from 10.5 - 0.5. When the pump is running at the lowest speed it only draws 0.5 amps and when it is dialed to the highest speed of 2.7 HP then it will draw 10.5 amps. Hi, Allan. Unfortunately, this Prime 2.7 VS Pump will not be a suitable replacement. The performance and physical features are different. I would recommend the Jandy ePump - VSSHP270AUT. IS THERE A PROGRAM FOR POOL BUILDERS ? Hi, Wade. I'm sorry, we do not have a program for pool builders. I have a community pool that requires the safety vacuum release sensor. Does this pump have one just incase something gets stuck to the suction line? Hi. This pump does not have the SVRS feature. Hi. You can use the Jandy VS Pump - VSSHP270AUT, the Prime Pump will not perform the same as the Stealth pump. Is this pump quiet than most 2 hp pumps? Hi, Jack. This pump is quit as the motor is a TEFC, and sealed. How does the PureLine 2.7 compare to the Pentair 011018 3hp and the Hayward SP3206VSP 2.7hp in quality, performance, and reliability? I understand the price differences. A Answered on 5/14/2018 by InyoPools Product Specialist Robert M.
We spent a lot of time this past season testing and programming all of the variable speed pumps. The top two, in our opinion, was the PureLine Prime VS and the Pentair Intelliflo. These systems were the easiest to program and install. Both units are very durable. The Pentair has been around longer but this is the 3rd year offering the Prime VS and we have seen very few issues. If you plan on installing this pump yourself, you may want to consider the Prime. The Prime has an 18 month warranty for do-it-yourself pool owners. The Intelliflo has a two year warranty but only if a licensed professional performs the installation. Otherwise, it's 60 days. i just purchased this pump and am ready to install. I have three questions: 1. My old ss pump was connected directly to a dial timer, can i use this setup or should i bypass the dial timer and power the pump directly and use the built in timer? 2. I also purchased the PureLine PL7704 Salt System (60K), should this be wired to the dial timer or directly to my new PL2606 pump? 3. Can i add the phone control unit to my PL2606 pump as an add-on or is it only included with PL2616? Thanks! A Answered on 5/8/2018 by InyoPools Product Specialist Robert M.
Hello Chris - 1) You can bypass the timer or keep the timer and wire the pump to the "load" terminals. 2) Either way will work and get the job done. You can connect the salt system to the timer's "line" terminals and then set the timer to turn the salt system on/off. The other option is to connect the timer to the "AUX" terminal connection on the new pump motor. 3) You can add the phone control unit to the PL2606 as an add-on. The part number is VL100. Can this pump be programmed to run for a certain number of hours each day? A Answered on 4/28/2018 by InyoPools Product Specialist Patrick P.
Yes this pump has a built in timer where you can set multiple start and stop times as well as RPM settings. For example run from Noon to 2pm at 2,000 RPM's and then 2pm to 6pm at 1500 RPM's. Hi - I have a 20,000 gal pool with spa, shark, and salt. Its roughly 15 feet from the pool. It currently has a Hayward NorthStar Pump, 2 HP .33 (two speed) motor. And an Aqua Logic control with remote. What would be the most energy efficient and compatible replacement pump/motor? Hi Vern, Based on the set up you outlined the PL2606 PureLine Prime 2.7 HP Variable Speed Pump would be a great replacement for you. The variable speed capability will really allow you a lot of flexibility. 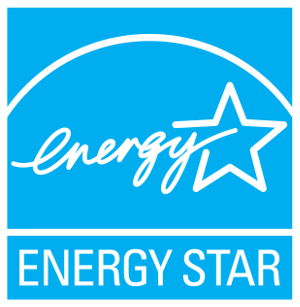 Also the PureLine Prime is now Energy Star Certified so you may be eligible for additional rebates with your power company. Would this also work as a replacement for a Superflo without any significant plumbing modifications? Hi, Eric. Yes, you will only have to make minor alterations to your plumbing. Need drop in for Hayward SP3400vsp. Would this be it? Hi. Unfortunately, this pump would not work as a drop-in replacement. Howeve, i can be used as a replacement depending on the TDH of your pool. I am looking at replacing a Hayward SP3400VSP, 2HP for a 36,000 gal pool with about 80 feet between the pump and the skimmers. Would the PL2606 work as a replacement? A Answered on 4/17/2018 by InyoPools Product Specialist Patrick P.
Hi Mark, Yes this would be a great replacement pump for your Hayward SP3400VSP, 2HP. Looking to replace my Hayward SP4020NS 2.0HP with 2" fittings - Is this pump a drop in replacement? A Answered on 4/13/2018 by InyoPools Product Specialist Kevin G.
Hello, this would not be the drop in replacement. The closest replacement to your pump would be the SP3220EE. How long of the warranty for this model? Hi Rick, This pump has an 18-month warranty. A Answered on 11/14/2017 by InyoPools Product Specialist Lennox H.
Hi Jon, Yes, it will. The V-Green Automation Adapter Kit - 2517501-001 will allow the pump to be controlled by a third party automation controller. Will rthe Pureline 2,7 operate on the Hayward Omni Logic control system? A Answered on 10/31/2017 by InyoPools Product Specialist Lennox H.
Hi, Craig. You will need to purchase the V-Green Automation Adapter Kit - 2517501-001 to get this pump to communicate with the Hayward Omni Logic Controller. A Answered on 7/13/2017 by InyoPools Product Specialist Patrick P.
Hi Dave, this pump would be a great replacement for your 2 HP pump. This variable speed pump is ultra energy efficient and will save you quite a bit on your operational costs. Hi, I have a Hayward SP4020X25, 2 1/2 HP MR pump. Is this a good replacement for that? Also, do you have a dimensional drawing to see have close the fittings are to my current pump so I can decide if i can do the replacement myself. Hi, Chad. This Prime Pump is not a good replacement performance wise, I would recommend the Hayward Tristar Pump - SP3220X25. Click link >Prime 2.7 VS Pump Dimension to view the plumbing connection. Hi, This would be a perfect pump for the pool set up you described. Unfortunately the PureLine Prime Variable Speed is not currently on the SMUD product list for there rebate. Hi, Mike. An extended warranty can not be purchased. The warranty will not be voided if installed by the homeowner. The max RPM is 3450.
? Asked on 5/26/2017 by What is the warranty with DIY install? Hi, I am looking at this pump to replace a Waterway SVL56. What is the warranty if I purchase this from you and install it myself? Hi. The PureLime Prime 2.7 VS Pump has an 18 month warranty. Hi, Teddy. This PureLine Prime VS Pump would be a great pump to suit your pool and spa needs. I have a pool with about 33000 gallons of water and the average length of the lines is 80+ ft. I currently use a 2 HP Hayward super pump (7 hrs/day) and it works well. Will this unit work on my pool and what are the likely savings. Hi Tom, If you currently have a 2 HP Super Pump then this would be a great pump for you. The PureLine Prime Variable Speed will allow you to dial the HP all the way up to 2.7 HP for demanding conditions, but for most of your standard filtration you can dial the HP way down, probably down to 1 HP or so for your pool, and you will save roughly 40% on your operational cost running at 1 HP vs. 2 HP. A Answered on 5/2/2017 by InyoPools Product Specialist Scott W.
That PL2606 would most likely be the one I would recommend, but if you know the distance from your pump to your skimmers I can confirm that the flow rate will be adequate enough with that pump. Hi. This pump is not Energy Star certified. Do you just have a pool, or do you have other features such as a hot tub, waterfall, suction side cleaner, anything that requires you to have a 2HP pump? Hi, Steve. You can view our complete return policy by clicking this link > Inyo Return Policy. A Answered on 7/13/2016 by InyoPools Product Specialist Joe S.
The PureLine Prime Variable Speed Pump is an exact replacement to the Hayward Super Pump Variable Speed Pump, making it quick and cost efficient to replace. You would need to move the pipes to have this pump installed. I can't find any flow ratings for this pump. How much flow does it produce? Hi Allen, We do not have a flow chart for this pump, if you can provide the "feet of head" of your pool we can provide you with an estimated flow rate base off of the Prime Pump Single Speed Flow Chart. I had to replace a Northstar 2hp full rated pump that finally gave up the ghost! After having the local pool guy come in and charge me $500 for a repair that didn't work, I decided to "upgrade" to a new VS pump. After doing a lot of research, I settled on the Pureline VS 2.7hp and started the work to replace the existing pump. Looking at the current plumbing and valve setup, I decided this was the opportunity to start "fresh." from Inyo. Probably will figure it out myself, as usual! Easy to change pump and the quality of the pump is excellent. Dont overpay ! My other motor fixing to go out ! Great quiet, efficient pump! I have owned this pump almost 9 months now, and wanted to wait a bit to review it. I used this to replace an aging single-speed 1½ HP Hayward Super Pump. Since this unit is a clone of Hayward's Super Pump Series, the swap-out was relatively painless. I originally wanted to use the PureLine 1.65HP, but I later found that the 2.7HP pump has a relay in it that can be used to power on/off my Polaris booster pump. Even though this is a 2.7HP and can go up to 3450 RPM, I usually only need to run it at 1500 RPM most of the day, which is plenty to keep the flow going for the salt water chlorine generator and filter the water. I ramp it up to 2875 RPM for about 2 hours a day to skim the surface and run the Polaris sweep. In addition, I love having the variable speed on this pump. For most of the day, the 1500 RPM speed I use is ridiculously quiet, and the 2875 RPM is louder, but it only runs for 2 hours. Since this unit is so much more efficient, I can run it 12 hours/day and still pay less than $17/month in electric costs. I don't really have any issues with this pump. My only minor complaint are the controls. I used the on-board controls for a short time before upgrading to a VLink, which I have reviewed separately. The on-board controls did not have a manual setting for the auxiliary relay. You have to set it up to come on at a certain RPM. The VLink changed all that and made scheduling much easier. I have attached a photo of the pump setup. If you notice in the photo, the control panel is missing. The VLink replaces the on-board controls and is located away from the pump. Overall great pump and a great price! The pump is simple to use and does exactly what it is supposed to do with a preset program it really does the job. The only reason I gave it 4 stars is that it is a little noisier than I anticipated. I would recommend a sound barrier enclosure if it is going to be close to the spa or where people are going to gather to talk. Just installed this pump to replace an aging Super Pump. I found the pump sits about 1/4 inch lower than my existing pump but it was easy to add a spacer to make up the distance (used a piece of ceramic tile). The display can be rotated 180 degrees so it can be viewed from the rear or front of the pump. The interface is easy to use and setup was a breeze. Three different speeds and corresponding run times can be chosen over a 24 hour period. Overrides for high and low speed can be chosen with shortcut buttons and can be set up for preferred speeds and times to run. Freeze protection is an option available in the setup menu. Percent of load and wattage shown on display when pump runs. Much more quieter operation than the single speed Super Pump. At time of installation and start up I am very satisfied with my purchase. This PureLine Prime pump is a beast, it is very powerful on the high speed but you have the ability to dial it down very low to save money on the low speed. The Prime Pump is extremely quiet on the low speed. Overall I'm extremely happy with this purchase.